Important Updates from the Clinical Compass! NEW CHIROPRACTIC BOOKS PUBLISHED -CCGPP Commission Chair, Cheryl Hawk, DC, has published two books that may be of interested to you. Both are available from the publisher at a 20% discount. Pleaseclick the links below for details. FUNDING THE NEXT STUDY ON THE IMPACT OF CHIROPRACTIC CARE ON OPIOID USE -Dr. Jim Whedon recently presented a study at DC2017 on over 13,000 THOUSAND subjects, some of whom received chiropractic care, and some of whom did not. The results? Those who received chiropractic care had a 55% lower chance of receiving an opioid prescription than those who did not receive chiropractic care. Further, overall healthcare costs were lower for those receiving chiropractic care.We are now working to fund the next study that may have over 1 million subjects! We need your help! Please donate what you can at http://clinicalcompass.org/donate. Contact CCGPP at ccgpp@sc.rr.comor 803-356-6809. 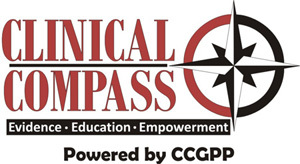 Learn more about CCGPP atwww.clinicalcompass.org.